I can't believe it's almost the end of September already. I've had to keep this monthly mini project on the back burner and wanted to get this done before I forgot it completely. 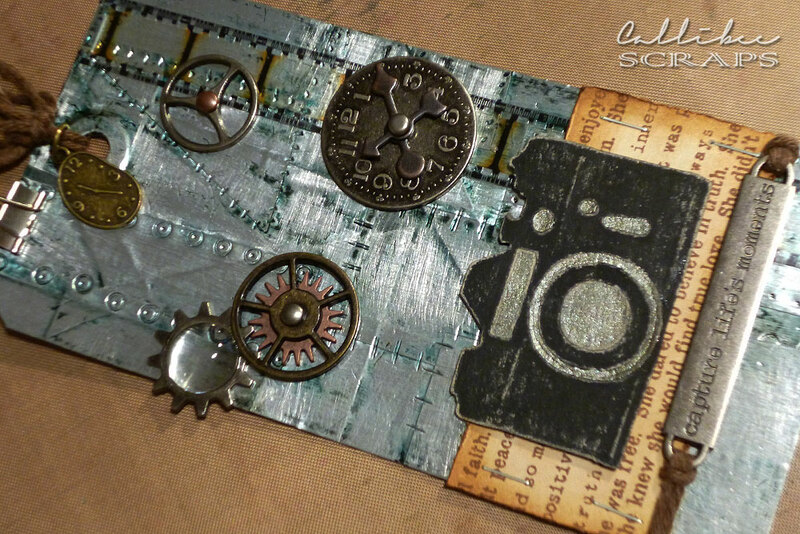 I love this technique by Tim Holtz. So effective yet simple. 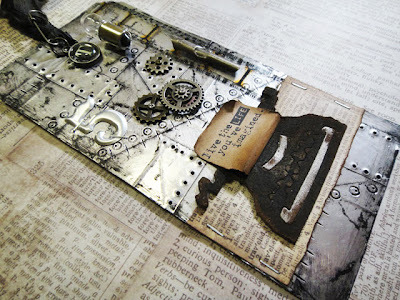 I will definitely be using more foil in my layouts in this way. Thanks again Tim for another wonderful tag. Look at that metal finish. It's amazing how you can achieve this look. I used slate, ginger and stream alcohol inks colours. I had the camera instead of the typewriter which I used with a "capture the moment" metal tag. I added a glass bevel over one of the sprockets for added interest. I love clocks at the moment, so used that instead of the ink nib. Wish I had the light bulb as that is such a cute accent.